Miss Loretta O. Douglas was born on July 8, 1865 in Saxonville, Massachusetts. She was the daughter of Andrew and Adelia (Bremen) Douglas. Her family moved to Little Falls in 1871. Miss Douglas graduated from Little Falls High School. She graduated from college in 1884, with a class of 61 members, from Cortland Normal School. She majored in languages at Cortland. After graduation, she began her first teaching positions, which were in Cazenovia and Stamford Delaware County. Miss Douglas began her teaching career, with the Ilion Union School District, in 1892. She taught at the Morgan Street School under the leadership of Superintendent/Principal Judson I. Wood. Later, she worked with Superintendent/Principal Alfred W. Abrams. Her official title was Preceptress. She taught courses in Literature, Latin and Elocution. Four years later, in 1896, the district appointed her head of the English Department at The Morgan Street School. Miss Douglas was appointed Principal of the school in 1909. She held that position until 1920. She was the first principal of the High School at its present location on Weber Avenue. During her career, she also studied public speaking at Syracuse University and attended summer school at Cornell University. She earned her Ph. D from Wesleyan University, Bloomingdale, Illinois. From 1920 until her retirement in 1930, she held a post in the English department of Utica Free Academy. Miss Loretta O. Douglas retired, in 1930, from her 46-year career in education. Harry DeGroat, a former principal of Cortland Normal School and supervisor of New York State Regents examiners, said that Miss Douglas was "...one of the greatest teachers Cortland Normal School produced in its history." 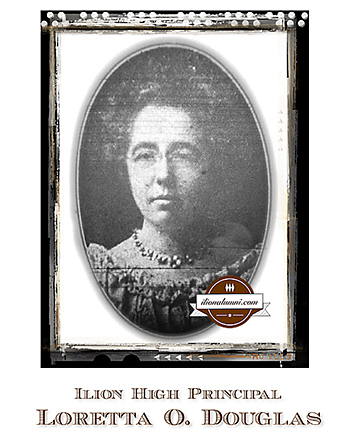 Ilion's Regents record was second only to that of the Brooklyn Boys' High School while she was Principal. A surprise tribute was paid to Miss Douglas during the 1917 Alumni dinner. A member of the Class of 1872, Frank Giblin, spoke in her honor. On behalf of the alumni, he presented her with a purse of gold as a testimonial of the long years of her excellent service rendered for the boys and girls of Ilion. The 1935 Annual Alumni Dinner was held in the high school gymnasium. Miss Douglas was the guest of honor at the dinner that was attended by 283 people. She received a standing ovation from her former pupils. She spoke at the dinner and said that the many years she had spent, in this village, as principal of the high school, were "the happiest in her life and would always remain in her memory." Her address concluded with this statement, "The abiding joy of my life is my alumni." The 1938 Alumni Banquet once, again, honored Miss Douglas. The reunion was held June 29, 1938. The Class of 1913 celebrated its 25th anniversary. 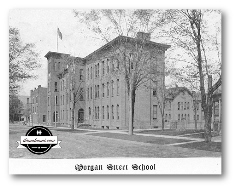 It was the last class to graduate from Morgan Street School in 1913. Miss Douglas was the mentor for the Class of 1913. The Class of 1888 celebrated its 50th anniversary. Class of 1888 members who attended the dinner were Mrs. Charles Wheeler, Mrs. Flora Knandel, Frank Segar and Samuel Allston. Other guests were the former superintendent of schools, Harwood M. Schwartz, professor of education, at St. Lawrence University and Frank D. Warren, Orange New Jersey. Miss Douglas attended many alumni dinners. She spoke at the 1944 Alumni Banquet and offered reminiscences of her years of service. The principal speaker at the dinner was the president of the Class of 1933, the Rev. Francis Scott, assistant pastor of St. Francis de Sales parish in Herkimer. Carl W Peterson, another graduate and district attorney, was toastmaster. The Ilion Alumni Association held its 100th reunion in June 1981. Three hundred Alumni and guests were still remembering Miss Douglas when she was principal at The Morgan Street School. If a student needed to be disciplined, the student had to serve time. Helen Warner, IHS Class of 1912, said serving time meant filling out her "whispering papers" which were large charts with figures that had to be filled in by addition. "When it was complete, you could go home," Warner said. "But that could be five or six o'clock, especially for me because I was bad in arithmetic and I had my share of whispering papers." The Ilion Sentinel December 16, 1944 newspaper article featured a story about her. A Sentinel reporter interviewed her, at her home, located at 1229 Kemble Street, Utica, New York. The article stated that many of her former pupils stopped by her Utica apartment to visit with her frequently. "That her system was effective during the time she taught here is evident. For many, Ilion High School ranked second in the state school rating." "Many of Miss Douglas's students today occupy places of prominence and influence in the world of today. One of her students was Albert Ross, now a vice-president of the Remington-Rand organization. She recalls him as a brilliant student and a young man of steady character." Other prominent citizens, who were students of Miss Douglas, were also listed in the article. Former students, Leon Jarvis, Albert J. Schulz and Albert J. Schesch visited Miss Douglas on her birthday on July 8, 1945. The alumni went to her Kemble Street apartment in Utica and presented her with 80 roses. The flowers were to observe her 80th birthday. Miss Douglas was still held in high esteem by her former students. Miss Loretta O. Douglas, former Principal of Ilion High school, died October 12, 1945, in St. Elizabeth's Hospital. She died after an illness of several months. She was 80 years old. 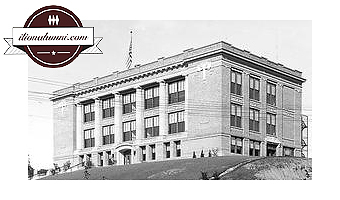 Miss Douglas began her teaching career, with the Ilion Union School District, in 1892. She was appointed Principal of the Morgan Street School in 1909. She was the Ilion Principal until 1920. Miss Douglas faithfully attended the annual Ilion Alumni banquets, until 1945, when she was confined to her home by illness. 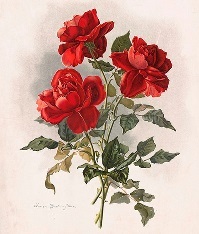 Former students visited with her on her birthday, on July 8, 1945, to present her with a bouquet of eighty roses. She was a member of Grace Church and secretary of its Women's Auxiliary for nine years. She was also a member of the Women's Republican Club of Utica, the Western Group of College Women, Utica Chapter of AAUW, the YWCA, the Utica Hobby Club, the Travelers' Club and the Shakespeare Club of Ilion. She traveled in European countries, Italy, England and Scotland and shared her experiences with the Traveler's Club. She was survived by her brother, Dr. Fred J. Douglas, Utica, a niece, Mrs. Mason F. Sexton, 4 nephews and several grand nieces and nephews. Her funeral was held Monday, October 15, 1945. Six honorary and six active pallbearers, at her funeral, were former Ilion students. Honorary bearers were Dr. C. J. Diss, Rome Worden, Kent McGowan, Arthur Kunze, Walter Griswoid and Bert Hawks. Active bearers were Leon Jarvis, Albert Schulz, Reginal Griswold, Fred Rhodes, Harold Fear and Carl Peterson. Dr. Fred James Douglas was the younger brother of Loretta Douglas. Her brother was born on September 14, 1869 in Clinton, Massachusetts. He attended public school in Little Falls, NY and graduated from Dartmouth College's Medical Department in 1895. He began his medical practice in Utica, New York in 1895. 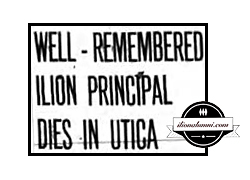 Dr. Douglas was a member of the board of education of Utica from 1910 to 1920. He served as Mayor of Utica from 1922 to 1924. He was commissioner of public safety of Utica in 1928-29. In 1934, he was an unsuccessful candidate for Lieutenant Governor of New York State. He ran as a Republican for Congress. He was elected to Congress for three succeeding terms. He served in Congress from January 3, 1937 to January 3, 1945. In 1945, he resumed his former profession as a surgeon. Dr. Fred James Douglas died on January 1, 1949, in Utica. His interment was in Mount Olivet Cemetery, Whitesboro, New York.